so as an update I got the head back from the shop and that’s back on the block waiting for a torque wrench. I’m currently saving up for body bushings and possibly air bags. In the meantime I swapped a Jeep Cherokee box with the stock a body box for the improved steering. when you put the adapters from the kit in the Jeep box will the old power steering hoses thread right in? So so far the box and linkage went in without too much issue..... just have to tighten some bolts and install hoses. also have any of you gents done this swap? Is it worth the hassle? This is really a thing? I thought Jeeps had some of the worst steering in the industry. It seems to me that the GM Saginaw steering boxes such as used across their product line from the sixties on just got better every few years, by the time they were supplying on Jeep Cherokees they were really very good. It will be up to you whether you like the ratio but I'd bet you will, it will likely be a little faster than your stock box but not too fast. I'm sure that whatever Lee is selling is OK stuff, but as far as the fittings go you'll just have to try it. Lots of info on the swap via internet. it's all the same think, the Jeep box is popular because there's billions of them out there - but its genesis is the quicker ratio boxes. It's why I grabbed the steering box off the GNX that donated its motor for my wagon. I still have no plans of putting power steering in it, but that box is more valuable then the motor and trans. Last edited by SuperBuickGuy; March 5th, 2019, 09:53 AM. You'll have to find out what type fittings the jeep box what model and year fittings it used. and what fittings gm used on the g body. Many use the mid 90's JEEP grand cherroke steering shaft that is a solid part with no rag joint. Many also use the astro van shaft and do a little mod to them. I have the Astro shaft for my g body, but I'm questioning if it is such a good idea. The g body frame as it comes from g.m. new is weak and flexes ALOT , . don't think so, jack up the car under the engine crossmember, and then put it on jackstands on the fram under the a pillar/cowl and watch the weight of the engine make the front droop. A solid shaft, works great on the unitbody jeep as the box and steering column is both mounted to the unit body. The g body the box is mounted to the frame and the column to the body that is on bushings. that will give some, but the frame flexing will be putting lateral forces on the bearings in the box. as that solid shaft has no give like the rag joint did. I'm questioning using mine as This might be one of those mods. those that are autocrossing the cars do that makes the steering feedback much better as the cost of trashing the box and column bearings, or it'll just break the melted plastic pins that hold the collapsing shaft in column to allow it to move in and out. some. I have not looked deep enough into this yet as the parts are sitting on a shelf. along with the drop spindles and springs and such. The astro frame doesn't flex as much as the g body. . it is kinda scary how weak the g body frames are. An easy way to tell what fittings go into the box is, find out what year jeep and model cherrokke or grand cherroke.box you have and take your high pressure line from the g body with you to a parts store that has the jeeps h/p line in stock and compare them. Last edited by JamesMayberryIII; March 8th, 2019, 10:45 AM. Obviously, the non-pressure side doesn't matter.... so just one adapter. It gets confusing when you add hydroboost. How does that fitting work when the hoses are male and the box is female? 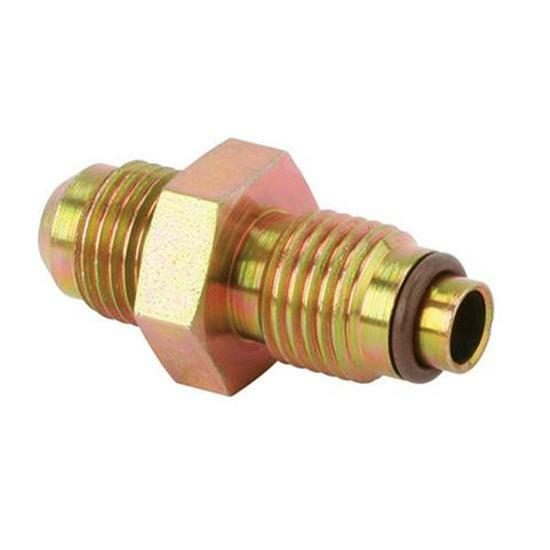 There is a female/male adapter - that one illustrates the difference between the two fittings. Of course, in this day and age - you can buy a hose that is old GM on one end and new "GM" on the other.... or get a braided one, and the list goes on of the possibilities.... but again, my point was to illustrate the difference between the o-ring and compression fitting. Last edited by SuperBuickGuy; March 8th, 2019, 10:30 PM. I see. I’m going to need new hoses soon anyway. These are at least 20 years old. I dunno if hoses could last fifty years. Got the box in and all hooked up. Ran the car for a bit and turned the wheel back and forth trying to cycle some fluid through the box. Not impressed yet but I’ll judge it after I get out on the road. Is there something I can run through my ps system to clean it? Would be nice to have someone move the steering wheel while you are looking for the leak. All times are GMT-8. This page was generated at 04:12 PM.